Here's simple and easy method for campfire tin can cooking. 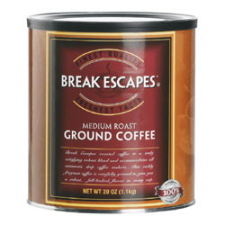 Set a large coffee can on the coals of your campfire. Then layer your food into the can, cover it and use the coffee can to cook your meal. Remember if your can has a plastic lid like this one please make sure to take it home and recycle with the can itself. Use an empty 44-ounce (1.25kg) tin coffee can or Milo can for your pot. Layer your food into the can. Seal the top of the coffee can with heavy-duty foil. Place the can onto the coals of your campfire. Put a few coals on top of the foil. Cook the can for 1/2 hour to 45 minutes. Serve up your mouth-watering meal! Suggested foods: Use hamburger or chicken, and top with onions, potatoes, carrots, mushrooms, and other vegetables. Save your old coffee cans, and try out this idea on your next camping trip. Just think, you won’t even need to bring a pan along! One word of caution, just make sure the inside of the tin can is plain old metal and not lined with plastic, paint or some other coating, otherwise it will ruin your dinner and probably isn't good for you either. Just remember to take your used tin can home with you and recycle, don't leave in the campfire coals, as it spoils it for the next person. If you like the idea of cooking your food in the campfire but want something you can use over and over again, then try a Cast-Iron Camp Dutch Oven shown here.